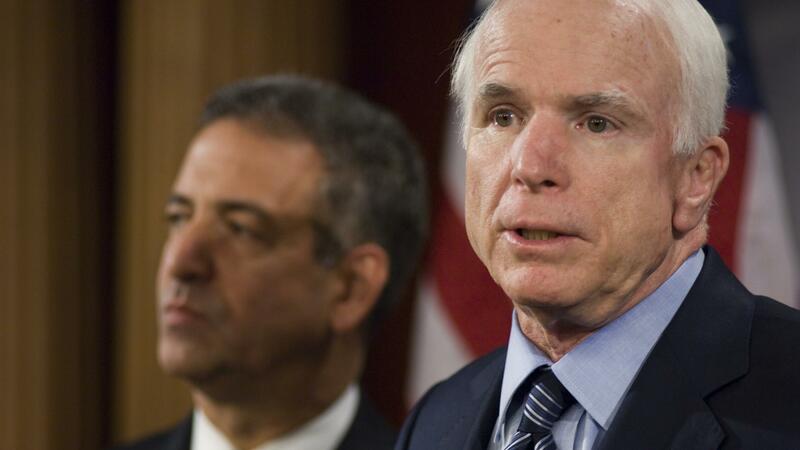 John McCain and Democrat Russ Feingold of Wisconsin co-sponsored a bill that became known as McCain-Feingold. 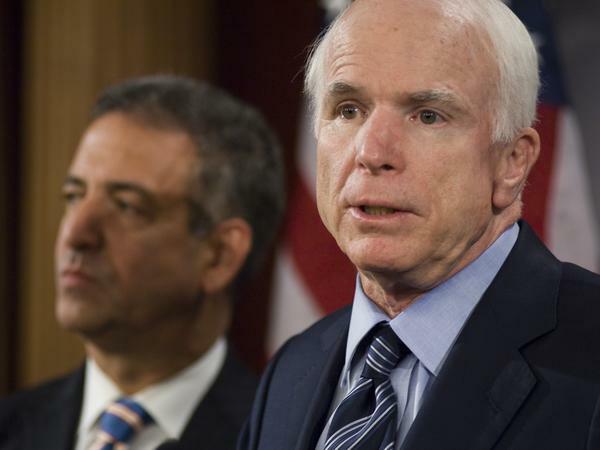 After partnering with Democrat Russ Feingold of Wisconsin, John McCain worked alongside many others on what campaign finance reform should look like and how they might outmaneuver Senate Republican leaders who wanted to sink the legislation. "Y'know, there's a little game they got in Washington," he told a crowd in New Hampshire in 1999. "And that is: Look at the tax bill when it comes out, to figure out who's getting the benefit — because of the very complex and convoluted way that they write the tax laws. And it's a disgrace." Although McCain, an Arizona Republican, lost the Republican nomination to George W. Bush, his warnings that money was corrupting politics reverberated in many state primaries, amplifying his message and propelling him toward an unexpected legislative triumph in the Senate that helped define his career. The message resonated with many New Hampshire voters, including Brenda Jameson, who met McCain at a town meeting in Hollis. "I'm excited to find somebody who is willing to say what needs to be said about what needs to be done, instead of just saying what people maybe want to hear – especially the people with the money," Jameson said afterwards. McCain, who served more than 30 years in the Senate, began as an unlikely crusader. In 1989, he was one of a group of lawmakers investigated by the Senate ethics committee. The "Keating Five," as they were known, had met with federal regulators on behalf of a big donor, businessman Charles Keating. The ethics committee wanted to know whether they had pressured government finance officials to go easy on Keating. The investigation concluded "that Senator McCain exercised poor judgment in intervening with the regulators." McCain was never eager to talk about the scandal, but he would draw a direct line from it to the weak campaign finance laws. Rolling down a New Hampshire highway with two aides and a reporter, he put it this way: "I could argue with you till I'm blue in the face that I did nothing wrong in the Keating affair, which might be technically true. But I know I did wrong by attending that meeting." Earlier in 1999, he came down even harder on both the campaign finance system and himself. Accepting a Profile in Courage Award from the John F. Kennedy Library Foundation, he said, "The people whom I serve believe that the means by which I came to office corrupt me. That shames me." McCain was given the award amid one of his best-known legislative campaigns and one that required some unlikely allies. "He just called me up out of the blue," said Russell Feingold, new to Washington as a freshman Democratic senator from Wisconsin. "He said, 'You seem to have a good record. Would you like to work with me?' And I said 'yeah.' So I never knew exactly why he chose that moment to do it, but he did." They co-sponsored a bill that became known as McCain-Feingold and built alliances with advocacy groups. One ally was the watchdog group Common Cause. That brought more than a touch of irony, as its then-president, Fred Wertheimer, told NPR: "I was the person who wrote the letter to the Senate Ethics Committee that triggered the Keating Five investigation." Wertheimer says he and McCain never discussed that. They worked alongside many others on what McCain-Feingold would do and how they might outmaneuver Senate Republican leaders who wanted to sink the legislation. "He was simply fearless. Nothing really fazed him," Wertheimer said. By today's standards on Capitol Hill, the Senate's March 2001 showdown over McCain-Feingold looked quaint: It consumed 11 days of floor time. Forty amendments were considered. Which isn't to say it was polite. Republican Sen. Mitch McConnell, leading the opposition, said, "I hope senators will uphold the oaths they've taken and oppose this unconstitutional bill." The battle raged into the House and then back to the Senate before President George W. Bush eventually signed McCain-Feingold into law without ceremony in March 2002. Under the Bipartisan Campaign Reform Act of 2002, as it was technically known, the Democratic and Republican party committees had to stop raising so-called "soft money" – unlimited contributions from corporations, unions and the wealthy. Tax-exempt groups had to start disclosing the money behind some of their TV ads. McCain and Feingold's law was also responsible for introducing a new phrase into the lexicon of American politics: Its requirement that candidates "stand by your ad" meant that politicians began appearing at the end of their TV spots and saying, for example: "I'm Jim Humphreys and I approve this message." But McCain and Feingold's law turned out to be a high-water mark for campaign finance regulation. Since it was passed, the Supreme Court has handed down decisions, including Citizens United v. the Federal Elections Commission in 2010, that opened new channels for unlimited and sometimes secret money. The court has also overturned some parts of McCain-Feingold. The soft money ban survived a constitutional challenge, although the newly created conduits make it less relevant. McCain reflected on the reversals in a 2014 question-and-answer session at Harvard's Institute of Politics: "We go through it historically: reform, corruption, reform, corruption," he said. "Right now, in my view, we're at the height of corruption, thanks to the United States Supreme Court." He turned his focus back to other issues, notably national security, immigration and health care. But ultimately, McCain decided to take another shot at campaign finance — last October, he co-sponsored a bill to stop anonymous political ads online.